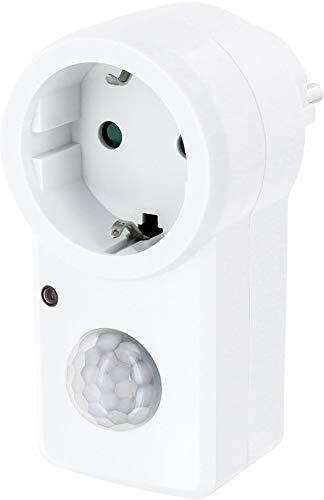 - Practical intermediate connector with PIR motion detector and twilight sensor, the practical intermediate plug automatically switches on when moving thanks to the integrated PIR sensor. - Power – switching capacity: max. 1200W and 230V, standby consumption only approx. 0.5W. - Material – housing made from PVC, white; function – auto on/off. - Sensor data – range 2-9m, detection angle 120°, light detection adjustable 3-2000 Lux, switching time adjustable 10s to 10min. - Dimensions – 100 mm x 50 mm x 40 mm (without plug); energy data – 220-240V, 50-60Hz AC, IP20 protection, energy consumption on standby 0.5W.